Save time and trouble when using Scala to build object-oriented, functional, and concurrent applications. 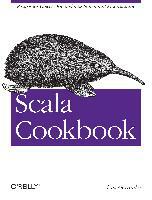 With more than 250 ready-to-use recipes and 700 code examples, this comprehensive cookbook covers the most common problems you&#x2019;ll encounter when using the Scala language, libraries, and tools. It&#x2019;s ideal not only for experienced Scala developers, but also for programmers learning to use this JVM language. Alvin took the circuitous route to software development. He managed to get a degree in Aerospace Engineering from Texas A&M University, while all he was really trying to do was play baseball. Once he became a practicing engineer, he realized he liked software and programming more than engineering. After teaching himself everything from Fortran and C, to Java, Python, and Scala, he also created devdaily.com, which receives millions of page views every year, and started a new software consulting business, Valley Programming.